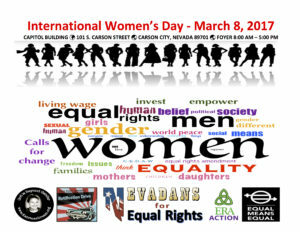 The Empowering Women Event will start at 8:00 am at the Nevada State Legislature Foyer at 401 S. Carson Street, Carson City, NV 89701. Staffing the table will be Helene de Boissiere Swanson who completed a 7,000 mile spiritual pilgrimage on foot traveling across all 15 states that have not yet ratified the Equal Rights Amendment (ERA). Educational material from ERA Action and information on how to hold a house party for the documentary Equal Means Equal will be distributed. 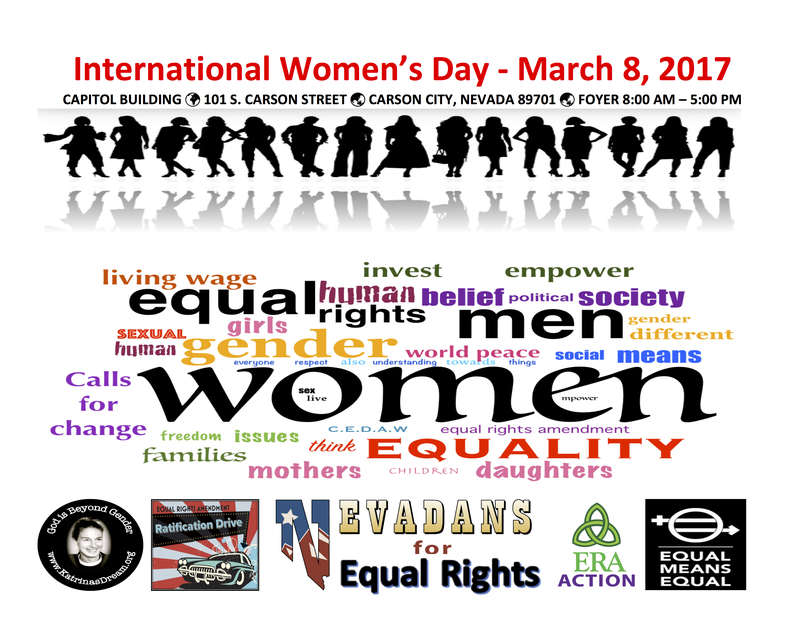 Visitors will be photographed as desired and invited to ask legislators to continue supporting and voting for Nevada ratification of the ERA. While Swanson continued her ERA pilgrimage, Dean led a new statewide push for Nevada ratification and asked Senator Pat Spearman (D-North Las Vegas) to introduce a new Senate Joint Resolution for it in 2015. Although the resolution (S.J.R. 16) did not make it out of committee despite strong public actions, Dean and others gratefully accepted Spearman’s firm promise to introduce a new S.J.R. in 2017. On February 13, 2017, Spearman introduced S.J.R. 2 for Nevada ratification and it was quickly assigned to committee. 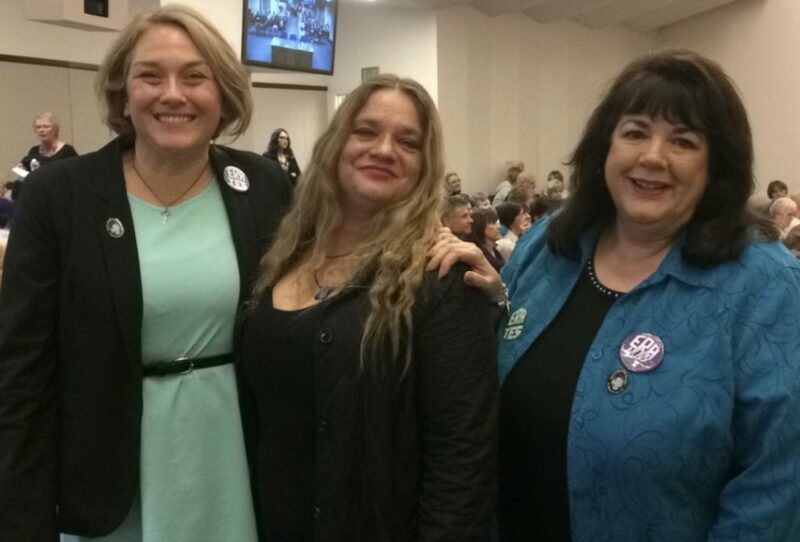 Tammy Simkins, Helene de Boissiere Swanson, Cathy Kaelin at the Nevada Legislature. On March 1, 2017, the 79th Nevada Senate Legislature voted 13 to 8 to pass the Equal rights Amendment bringing Nevada a step closer to ratifying the ERA. The bill will be sent to the Assembly Legislative Operations and Elections Committee with the expectation that it too will go to the floor for a vote to the full assembly for passage. Swanson, an aspirant to the priesthood founded Katrina’s Dream in memory of her late mother-in-law, the Rev. Katrina Martha Van Alstyne Welles Swanson. Katrina was one of the 11 women irregularly ordained to the priesthood in 1974, becoming the U.S. Episcopal Church’s first female priests. When the ERA failed to be ratified by the necessary 38 states, Katrina began to recite the Pledge of Allegiance “with Liberty and Justice for SOME!” When questioned “Why ‘some”? she would reply, “Because the ERA was voted down, retired women are more likely to live in poverty than men. On March 8, 2014, Swanson left on a spiritual pilgrimage from the Golden Gate Bridge in San Francisco arriving in Washington, DC on August 26, 2015, where the first Annual Women’s Equality Day Vigil, March and Rally was held. Swanson is writing a book on her pilgrimage and as Katrina’s Dream’s Goodwill Ambassador is active in developing sustainable practices in Africa, India and the United States and the full inclusion of women in all areas of life. Media Links on Nevada’s Coverage of 7000 mile Walk for the ERA.